As far back as the 6th century AD, Confucianism, Taoism, and Buddhism were merged into a harmonious conglomerate in Chinese thought called the three teachings (Traditional Chinese: 三教; San Jiao). Confucianism is a system of ethical and philosophical teachings founded by Confucius during the Spring and Autumn Period (771 to 476 BC) of the Zhou dynasty (1046 to 256 BC). Its main tenets include Ru (humaneness), righteousness, propriety, loyalty, and filial piety along with a commitment to social roles. 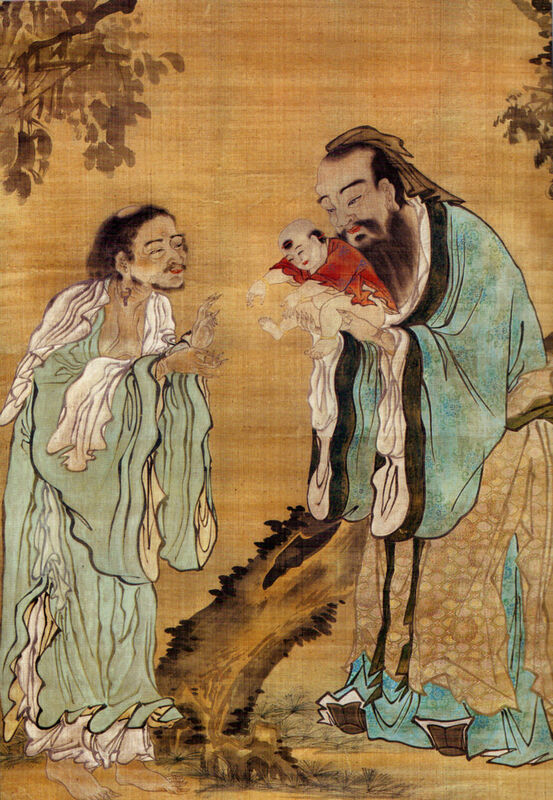 The five main relationships that Confucius defined for Chinese society were: ruler-subject, father-son, husband-wife, older sibling-young sibling, and friend-friend. In these relationships, the latter was expected to respect and serve the former, while the former was duty bound to care for the latter. Taoism, also called Daoism, is a philosophy based on the writings of Lao-tzu, or Laozi, (6th or 4th century BC) that advocate religious piety and humility. Its key elements are the Tao (the Way) and immortality along with an emphasis on the inherent balance of nature. Taoism focused on the interdependence of all things. The basis of Taoism lies in the concept of "wu wei", or "not doing". It refers to an intermediate state of "not doing" and "being, but not acting". Wu wei parallels the Confucian idea that a perfect sage could govern without taking action. Buddhism originated in India from the teachings of Siddhārtha Gautama (7th century BC) which were transmitted to China beginning in the 1st century AD through a series of Indian missionaries that included Buddhabhadra (5th century AD), who was the first abbot of the Shaolin Temple, and Bodhidharma (5th or 6th century AD), who was the first Buddhist patriarch of China. Its principle concepts are karma, reincarnation, and impermanence. It taught that suffering is intrinsic in life and that one can be freed of it by realizing enlightenment. Nirvana (a condition of perfect happiness) can be realized by rejecting material attachments and purifying the mind. Meditation is an essential element of practicing Buddhism. Its regular practice calms the mind and develops peacefulness and wisdom through the solving of daily passing problems in a temporary life. Another prominent Buddhist idea is the Eight-Fold Path. It is the fourth of the Four Noble Truths, which is the first of Buddha’s teachings. It stresses areas in life that can be examined and developed, like right speech and right intention. Zen Buddhism developed in China and spread to other parts of Asia. While Confucianism, Buddhism, and Taoism have coexisted for centuries in Chinese history, each practice has dominated or risen to favor over the others during certain time periods. Grand Master Chang San-Feng used elements from the "three teachings", though, to take Chinese martial arts, philosophy, and spirituality to greater heights, which are maintained in Detroit and Madison Heights classes offered by the Michigan Shaolin Wugong Temple.